A bunch of Auburn fans (understandably) got their dander up this week upon news that Brooks Brothers’ recently released Auburn collection (seemingly) included a houndstooth Auburn tie. Shug Jordan probably wouldn’t have had a problem with it. Now, like the Brooks Brothers tie, this might not be houndstooth. Who can say? 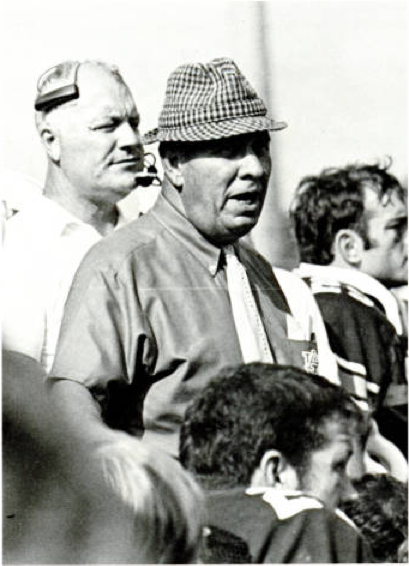 No one seems to know what houndstooth actually looks like, not even Bear Bryant. Point is, Shug never gave evil exclusive rights on what the Lord intended for good. Or at least he didn’t in this case. And as someone with a daughter whose favorite color is (temporarily) red, I feel that. UPDATED: Shug’s daughter confirms father’s affinity for houndstooth. Related: An Auburn Houndstooth Hat? That does not appear to be a “houndstooth check” but just a checked hat. Yes, many people do know what “houndstooth check” looks like. I love houndstooth and resent that fact that it is so closely associated with Bama. It was around many years before Bear put a hat on his head. I have a black and red houndstooth blouse and, when I wear it, kids think I am an Uof A fan. My daughter has a beautiful black and white houndstooth check suit but now would not wear it for any amount of money! If it has the AU on it, wear it!